Open Rights Group - EE and sale of user data: does Anonymisation work? EE and sale of user data: does Anonymisation work? This afternoon, EE called ORG to ask us about our blog. They did not question the article, but confirmed that it is their belief that IPSOS MORI employees misrepresented what the data they are offering can do. They said in response that “most” of the data is large, aggregated datasets, of around 50 users. However, their customers currently don’t know how and when their data might be aggregated or made available in an anonymised form. 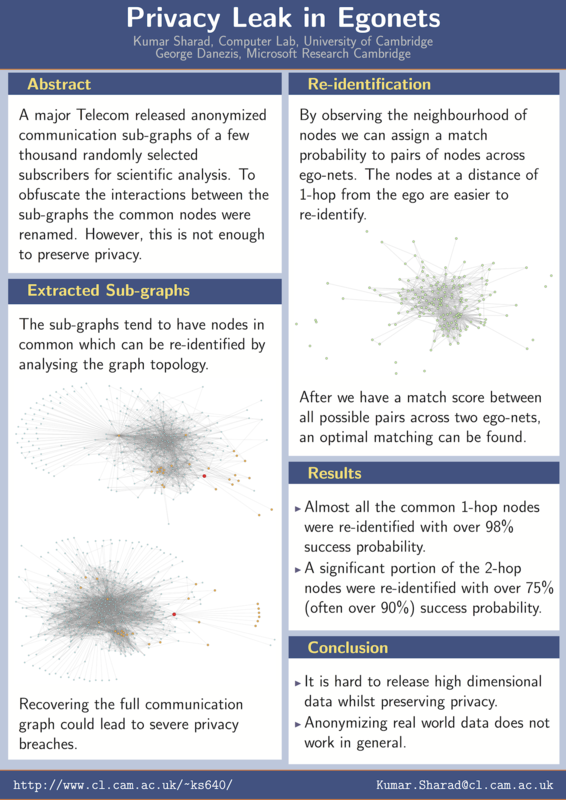 Cambridge research on network identification shows similar kinds of results. Ask for users’ permission before offering their anonymised data. Make this legally required in data protection, helpfully being debated right now. Open anonymisations techniques for peer review. Then the best brains can help spot mistakes. Such approaches take place in security software, e-voting software, and of course in Open Source software more widely. Offer “responsible disclosure” mechanisms for people to explain when they see mistakes, so data providers can stop the problem. Mobile companies are not the only people playing with fire in this way. There are also government data initiatives, which are even more worrying, looking at personal health data, education and benefits data. If you want to do something today, why not ask your MEP for strong data protection, as a first step?